I don’t usually eat breakfast and if I do it is typically a banana. Effortless and nutritious, it is my go-to especially when I’m away from home because it doesn’t come with any risks. Well, slipping on a peel may be considered one but we’ll let that slide. This morning I was just hungry. No way around it. I popped open the cupboard and saw a mini gluten free Purely Elizabeth granola. I’ve had her cranberry pecan blend before and was extremely happy with the balance of it, so when a sale hit at Naturally Soergel’s I decided to give the pumpkin fig flavor a chance. Most simply put, it tasted like autumn in a bag. Packed with cinnamon, and sweetened with coconut palm sugar, this pouch left me wanting more. Aside from the gf oats, it consisted of pumpkin seeds, dried fig bites, puffed amaranth, quinoa flakes, sunflower seeds and chia seeds. That is a significant amount of wholesomeness in one place. And it is all organic. I’m not into the organic hype but some people are, so it is worth mentioning. Any downsides? The fig bites were pretty hard, so the cranberry pecan will still be my first choice but this one will be making an appearance periodically. 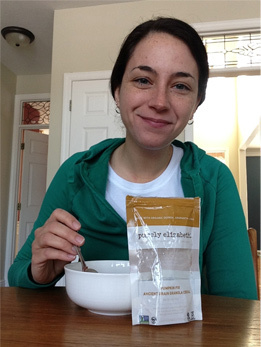 Creator of Purely Elizabeth, Elizabeth Stein, is on a solid track with her ancient grain granola cereal at least. I’ve eaten two of the four flavors which include pumpkin fig, cranberry pecan, original and blueberry hemp. Other products include Purely Elizabeth hot oatmeal, cookie mix and pancake mix. I haven’t tried them but after these, I wouldn’t hesitate to. Just remember to watch your intake because these crunchy calories can sneak up on you!